Unfinished floors are available in a variety of wood types and sizes, with the standard being a 3/4 x 2 1/4 oak strip. 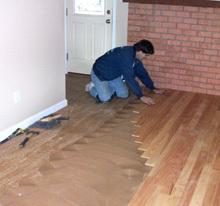 Most people choose unfinished floors (requires sanding), so they can choose the custom color they want. Prefinished floors come in a wide variety of products. Each strip of a prefinished floor has a beveled edge on each side to ensure that the floor is installed level, and that one piece does not sit higher than the other. There are different size bevels, including: standard, micro and square edge. Different levels of finish warranties are offered for each product. The price will vary depending on the type of bevel and finish warranty. Engineered floors are designed with several layers of different types of wood. The purpose of an engineered floor is to allow the wood to be installed below grade (basement) or on concrete. 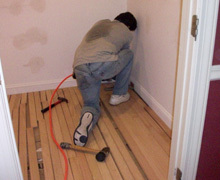 Installing a new floor or refinishing an old one will usually require removing and replacing the old shoemold. Floors by Dodd normally does this as part of a complete job. 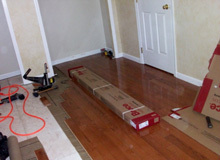 Floors by Dodd will also install baseboard molding, wood transitions and thresholds on an as needed basis.